Dr. Kirk W. Pomper is the Director of KSU Land Grant Programs. 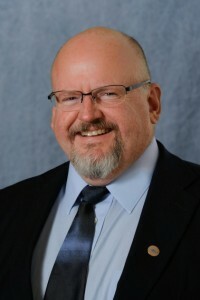 He provides leadership as Director of Research and Extension Programs in the Land Grant Program and College of Agriculture, Communities, and the Environment (ACE) at Kentucky State University, Frankfort. Dr. Pomper received both a B.S. and an M.S. in Horticulture from the University of Minnesota in 1985 and 1989, respectively. He received a Ph.D. in Horticulture in 1995 from Oregon State University. Dr. Pomper also serves as a Professor of Horticulture and is Curator of the USDA National Clonal Germplasm Repository for pawpaw species at KSU. His main research area has been in pawpaw germplasm development, physiology, nutrition, and organic production. Dr. Pomper has obtained over 4 million dollars in competitive grant funding from USDA and other granting agencies. He has published over 50 refereed publications in internationally recognized journals and in 2008 won the Shepard Award for the best research paper of the year published in the Journal of the American Pomological Society. His program selected KSU-AtwoodTM as KSU’s first pawpaw variety release to the public and this variety is being sold by nurseries nationwide.